This video lesson corresponds with Section 10 of the “I Want To Learn English” textbook. More videos are in the works that teachers and students can use that align with the lesson within the textbook. Feel free to share it with others. In 2016, I went to the TESOL Convention in Baltimore, Maryland because it was in my neck of the woods and there was much networking to do. For all intents and purposes, my time there was well spent. And though I met so many people and made some very good connections, a part of me longed to be included in the presenters circle. Well, this year, I get my chance. I put the notice out a few months ago that I will be presenting my research at TESOL 2017 and certainly I am quite excited about that. Just having my proposal accepted is an honor in itself, but I know there is a lot of more work that needs to be done. The interest in furthering research into the effects of infusing phonics with contextual instruction for adult and secondary learners is growing. This presentation is something I hope will generate even more interest from other professionals in the field and join me in collecting more data and adding to the conversation. If you are going to the TESOL International Convention in Seattle, please come to my session. Thank you. I am happy to announce there are several programs currently using the IWTLE textbook with beginners. At the end of 2016, various programs and schools in Pennsylvania, Missouri, California, New Jersey and Maryland started using the textbook with beginners and the feedback has been overwhelmingly positive. In an effort to support instructors, I keep an open channel of communication with programs and even provide some sample instructional videos to help in the process of implementing the lessons. There are, of course, people who purchase the textbook through amazon and other sources and they don’t always communicate with me directly, but the streaming of the audio files tells me people in other countries are also using IWTLE. These include Turkey, Saudi Arabia, Sudan, Brazil, the United Kingdom, Sweden, Mexico, Colombia, and several others. For instructors looking for some instructional ideas, or would like to see how I implement aspects of the textbook, I will share some videos of me working with actual students in my class. I will try to produce more videos as time goes on. Please feel free to contact me directly or share your comments. Thank you. Since the release of the “I Want To Learn English” textbook this past spring, its reception and demand has steadily increased. This past summer more schools, community colleges and learning centers have been piloting and adopting the “Swing Differentiation” model the textbook employs. This, as you can imagine, is welcomed news. With it has also come some new requests. In speaking to ESL coordinators and directors at community colleges, the conversation of a reading and writing strategy for beginner level ESL students has consistently come up. Naturally, I have been asked if this is something I would be working on. Well, as it so happens, I have been working on a reading and writing workbook for beginners. This workbook complements the IWTLE textbook in that it incorporates the themes from its four units. These include the phonics components of vowels, digraphs, consonant blends, diphthongs and other elements of the textbook. I figure it would be a good idea to look a little closer at the characters, the situations throughout the book, the puns (of course) and explore various cities throughout the United States. I recently mentioned to someone in a meeting about the textbook that it is in the “trial stages.” What this means is I already have lessons, activities and components being tested with students in the fall semester. Once these trials are complete and data supporting its effectiveness is concluded, it will be published. What makes the coming months even more exciting is there will be additions made online (this website) for students and instructors to interact with that continues the work in the IWTLE textbook. There will also be more assessments available for instructors and more listening activities for students to practice with. And more video lessons will be available for both students learning and instructors to see modeled lessons and to give ideas and strategies to use the components of the textbook in their classrooms. For students, there is a video on short vowels that was recently posted (see You Tube video below). Others will follow, so stay tuned. The 2016 TESOL Convention was on my home turf and it was a big occasion. It was the 50 year anniversary, my first textbook was published just a month before, and I was representing the AFT and Baltimore City Community College. Having colleagues, former professors, and new connections all under the same roof magnified the anticipation. The adrenaline was pumping on turbo. The timing of TESOL 2016 was impeccable, and I made sure to be there every day from the moment the doors opened on Monday morning until everyone scurried out at the last minute on Friday evening. It wasn’t necessary; it was crucial. I attended every session I could and networked with hundreds of people from all over the world. 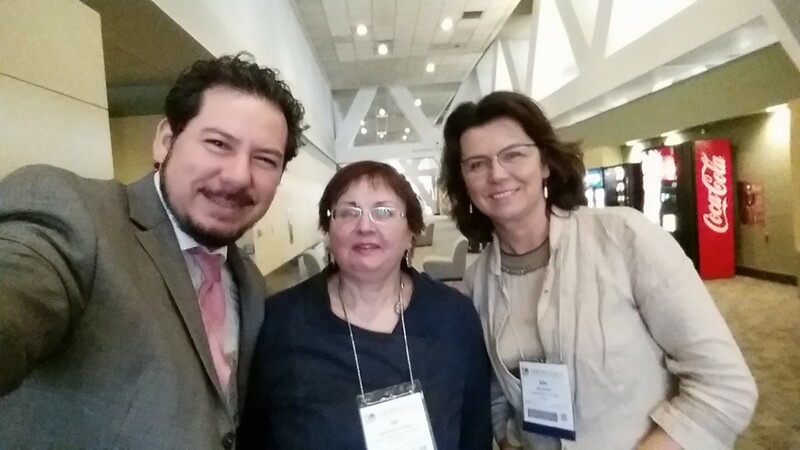 And why was I so immersed in TESOL 2016? Because everything is different now. The narrative on immigration and public funding for programs in general has shifted, and not just in the United States. The stakes seem to be getting higher simultaneously as our profession is making leaps in overall efficiency and the TESOL organization itself grows in size and importance. I roamed the halls and lobbies at the convention center for a one simple reason: networking. Some of it was to promote my textbook; some just to gain another nugget of knowledge to use in my quest to find “keys” that will contribute to unlocking some of the mysteries of adult language acquisition. And with every day there, I refined my ability to hone in on people who could be great contacts. I arrived as the sun was coming out and wouldn’t leave until the dark of night had fallen. As the final moments of the convention frittered, I was spent. My leaden body and feet slowed my pace as I left, but my mind remained ravenous. It is common practice for elementary teachers to go over phonics in the early grade levels (PK-1st grade). Little children have an inherent ability to absorb the phonetic structure of (any) language. Noam Chomsky attributes this to the L.A.D or Language Acquisition Device. It is widely believed by the teen years this L.A.D. begins to dissipate and people generally lose their abilities to acquire the essentials of a new language. This is believed by many to be due to the fact that by the young adult years, the mind has acquired what it needs to survive socially, culturally and otherwise. In contrast, it is also believed if people continue to learn new languages throughout their youth, the L.A.D. remains strong and people have been known to learn many new languages throughout their adult life. There have been a slew of studies to support the existence of the L.A.D. and its attributes, so it is difficult to argue the “use or lose it” tendency inherent with it. This is important to keep in mind when considering the difficulties adults encounter when learning a new language, especially the English language. English is an especially difficult language to learn because of its “Frankenstein” composition. English is comprised of several world languages (Old English, Latin, Germanic, Danish, Norse, French, Greek, to name some), and many of their original rules traveled with them into English. This is quite evident when someone is trying to understand the many pronunciations of “ough” in different English vocabulary words, for example. The English language is filled with such examples. Although these complexities seem arbitrary at times, they really exist as a culmination of old pronunciation rules (and syntax) and a creole effect, meshing several languages in parts and morphing with trending acceptances to the rules. If this seems confusing to the native English speaker, imagine the confusion to non-native speakers and people new to the language. The one thing that can tie everything together is establishing English at the phonetic level. Having a strong phonemic awareness is tied to literacy, as well as listening and speaking skills. Before tackling the daunting, complex rules of the English language, ELLs should first establish a strong phonetic foundation. The National Institute for Literacy published a report in an effort to “strengthen literacy across the lifespan” authorized by the U.S. Congress under two laws: the Adult Education and Family Literacy Act (AEFLA) and the No Child Left Behind Act (NCLB). The report’s section on “Alphabetics” (Chapter 4) is at the heart of what the I Want To Learn English textbook was designed to do with adult ELLs. The Phonemic Awareness Training and Phonics Instruction chapter gives a comprehensive synopsis of the complexities of teaching phonics to adult learners (click here to read the report). Many of the highlighted issues in this report are primarily what IWTLE addresses in the strategies and methods employed throughout the textbook. Instructors and administrators are encouraged to review this report. When the issues in the report are compared to what the student textbook covers, it will become apparent this textbook was tailored to meet the phonemic awareness needs of adult English Language Learners struggling with literacy and overall communications skills. With grant funded programs becoming more competitive and the needs for adult English learners to acquire the language more efficiently in order to apply their acquisitions at the workplace, the need for excellent language learning tools grows. “I Want To Learn English” takes all of these factors into consideration and works to resolve the fundamental needs of ESL students, which in turn will contribute to the improvement of communication in the workforce and make adult ESL (and high school) programs become more productive.